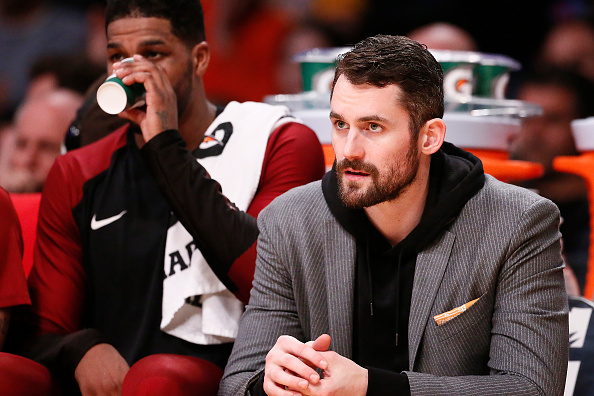 When I saw the news of Kevin Love signing his contract extension with the Cleveland Cavaliers this past summer, I had two immediate reactions. One – it was tough to believe the narrative he and the team were selling when it came to contending this season. Two – just because he signed an extension doesn’t mean he’s guaranteed to be a Cavalier once this year’s trade deadline passes. The first of those reactions came true, as instead of looking like competitive, Cleveland is the worst team in the NBA. The second, however, may not. Nor should it, if you ask me. While the likelihood of Love being traded in two weeks has certainly decreased since he underwent toe surgery earlier this season, I still believe the Cavs should keep him, both for this season and beyond. This thought may throw off more than a few, and understandably so. It wasn’t so long ago that I was explaining why Cleveland should shed whatever veterans it could, including Love. He was clearly frustrated about being duped by the front office into thinking this wasn’t a rebuilding year, and it only made sense to test the market for him. However, the longer this season (mercilessly) drags on, the easier it is to see why keeping Love should be Cleveland’s priority. The most obvious reason is, frankly, he probably wouldn’t net the team too much right now. As mentioned, Love has been sidelined since October after getting an operation on his toe. While he’s expected to return soon, it’s unlikely any team would be willing to pony up a ton of assets for someone who’s barely played this year. Outside of this, though, it’s important for the Cavs to hang on to Love because he represents something they didn’t have the last time they kicked off a post-LeBron rebuild – someone you can build around. To clarify, while I’m in no way labeling Love as Cleveland’s franchise player, he’s still significantly better than the players Cleveland had to work with in 2010. No matter what you think of him, you can’t deny Love is a major upgrade compared to what Cleveland had to work with back then. I know, I know, he’s doing very little to help the Cavs right now. He’s been sidelined for months, therefore unable to shed his ‘injury-prone’ label. When healthy, he tends to go cold on offense every now and then, as he’s yet to recapture the days of averaging 26 PPG like he did with the Minnesota Timberwolves. However, the Cavs need to think beyond this season. They’re currently primed to net a high draft pick next summer, ensuring they’ll be able to add a top-tier rookie who can hopefully speed up the rebuild process. This task is made even easier when you already have a five-time All-Star on your roster. Simply put, keeping Love ensures Cleveland doesn’t head into next season with a marquee rookie and a bunch of spare parts. That’s what Kyrie Irving endured after the Cavs drafted him in 2011, and the team spent the next three years stuck in the mud until James came back to save it. One could argue Cleveland would have to endure the same fate if it decided to move Love before the trade deadline. While rookie point guard Collin Sexton has shown promise, he clearly still has room to grow. Outside of him, Tristan Thompson and, at times, Cedi Osman or Jordan Clarkson, the cupboard is bare. Which is why hanging onto Love is the best option for the Cavs. This rebuild is far from complete. That said, you could argue dealing the only All-Star on your roster would only set it back further. Toss in the fact Love reportedly wants to stay in town despite being conned into thinking the Cavs were trying to contend, and you can see why trading him now doesn’t make much sense. Again, you may say he’s no great franchise’s idea of a cornerstone player. Maybe not, but if you were running the Cavs during a rebuild, would you rather have Love in your front court, or JJ Hickson?